The Kaituozhe-2 (KT-2) (KT-2) is a solid-fueled launch vehicle based on the DF-31 missile. KT-2 was developed by China Aerospace Science and Technology Corporation (CASIC). Two versions were proposed. The Kaituozhe-2 features a DF-31 based stage 1, topped by a smaller diameter stage 2 and 3. It has reportedly a payload of 800 kg to low earth orbit. 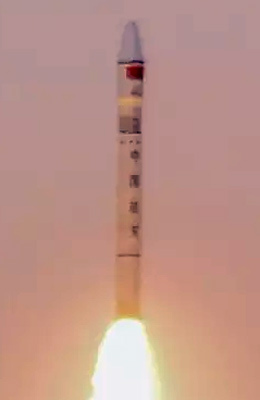 The Kaituozhe-2A features a DF-31 based stage 1, augmented by two DF-21 based strap-on boosters. It features a stage 2 with the same diameter as the stage 1 and the same smaller diameter stage 3 as the Kaituozhe-2. It has reportedly a payload of 2000 kg to low earth orbit. Originally it had been thhought, that the development of this rocket was stopped along with the Kaituozhe-1 (KT-1), but later there were indiaction of a continued development. These versions descriptions might be outdated. The maiden flight of a Kaituozhe-2 took place in March 2017 from Jiuquan. A flight of a Kaituozhe-2A is also planned for later in 2017.